Days after the plight of a soccer team trapped in a cave in Thailand captured the world’s attention, Elon Musk and his engineering team have developed a “kid-sized” submarine to evacuate the remaining children from their flooded cave. Twenty-three hours have passed since that tweet, meaning that the submarine has most likely arrived in Thailand, though it is not clear if the Thai government will employ Musk’s handiwork as it works to rescue the remaining boys from the cave. The story of the trapped boys has drawn significant media coverage from around the world since they were discovered in a flooded cave last week, and the rescue mission began on Sunday morning, with eight people safely out of the cave and five remaining as of Monday afternoon. Soon after the boys’ location was discovered on July 2, Musk shared ideas for a rescue mission and later announced that his engineers from Boring Company and Space X were en route to help with the rescue mission. While Hollywood hasn't quite switched over to full-on nihilism mode like it did in the Bush years -- yet -- we have gotten a few studio pictures this year that more or less capture the vibe of living under President Donald Trump in 2018 -- intentionally or not. 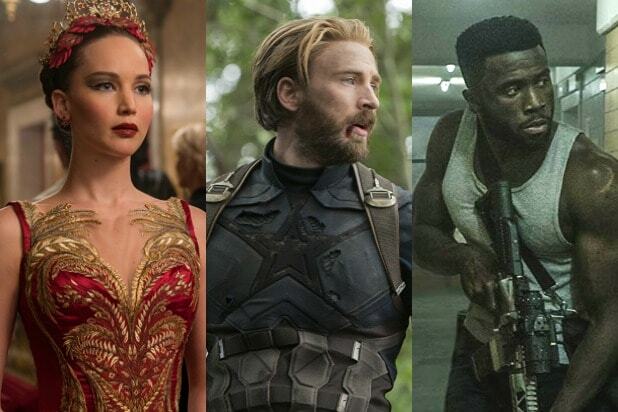 Warning: there are spoilers ahead for most of these movies. Also there's political commentary. "Avengers: Infinity War" -- A crazy, shocking, potentially world-shattering threat emerges, boasting heavy support from religious fundamentalists and spouting cliche Republican talking points about resource allocation and the need for a strongman to make decisions for everyone -- and wins. Trump's America is basically Thanos' entire universe. "Fifty Shades Freed" -- The "Fifty Shades" finale is basically the story of the extremely rich Christian Grey learning an important life lesson -- that he, as an orphan, potentially would have turned into a murderous psycho had he not been adopted by a rich family -- and then turning around and having kids the normal way with Ana because those orphans aren't my kids. "The First Purge" -- Given his open support for literal murderous dictators, it seems likelier with every new “Purge” movie that Donald Trump is going to want to institute the Purge IRL, right? It would be a bit on the nose but, well, he is President On The Nose. Plus, a major plot point has the government call in Russian support to interfere with an internal matter. "Gringo" -- The story of a nice and normal immigrant man with a normal white collar job who really just wants to live a normal life without anyone bothering him -- and so, of course, everyone tries to kill him. This is what living in 2018 America feels like. "Jurassic World: Fallen Kingdom" -- Some people have argued to me that "Fallen Kingdom" is bad because the bad people in these movies seem to get even dumber and do more inexplicable things with every new "Jurassic" installment. And to that I say: Donald Trump is president, so you may be holding movies to a higher standard of credibility than you are the reality of 2018. "Pacific Rim: Uprising" -- The world is almost destroyed by a guy who is secretly the puppet of foreign monsters. Hmm. "A Quiet Place" -- We finally figured out a way to defeat the monsters -- purely by accident and only after most of humanity was already wiped out. A vision of our future? "Red Sparrow" -- A really resourceful woman uses all her considerable subterfuge skills to outsmart hordes of predatory men and remove a single corrupt Russian government official from office. A heroic #resistance effort, and probably the best possible resolution to the situation -- and probably one that won't do much to help anyone in the near term. But maybe someday! "Sicario: Day of the Soldado" -- Maybe this type of "look at the secret bad things the government is doing!" story doesn't quite translate to Trump's America. But at the same time it's not hard to imagine Trump watching this movie and thinking invading Mexico to fight the cartels is a good idea. "Solo: A Star Wars Story" -- We wallow in nostalgia to try to make ourselves feel better but really we're not accomplishing anything. "Tyler Perry's Acrimony" -- This movie has a really clever conceit -- a crazy person narrates her life story, painting herself as the good guy while the movie itself is showing the truth of her badness. It's basically what watching any Trump speech feels like.